Overview of the route including flights from Chicago and Cedar Rapids. We’ve been lining up our next road trip for several months, but now that it’s less than two months away we can reveal the planned route. It’s a return to the American Southwest this April, highlighting Arizona and California. Travel partners Emily and Jake are also joining us for the first time since Alaska 2014! There will be three new national parks added to our tally: Saguaro, Petrified Forest and Death Valley, plus a revisit to Grand Canyon, and at least four National Monuments. The week begins by flying into Tucson, Arizona, where we’ll spend time at Saguaro National Park. Next up is a day exploring Petrified Forest National Park before continuing to far northeastern Arizona and Canyon de Chelly National Monument. Turning west, we’ll take a peek at Meteor Crater on the way to spending two nights in and around the city of Flagstaff. Several National Monuments dot the landscape around Flagstaff, so finding activities won’t be a problem. We can’t go this close to the Grand Canyon without stopping by, so we’ll make a quick return visit to try out a trail we didn’t hike on our 2012 excursion. Following Grand Canyon, we’ll enter California for the first time in five years and stay 2.5 days in Death Valley National Park. The flights home will be out of Las Vegas. Detail view of our path across Arizona, Nevada and California. 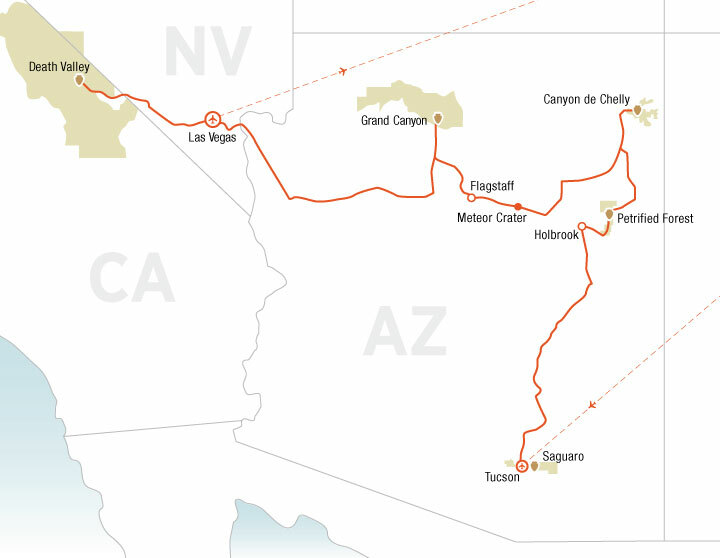 After this route, we will have just 13 more national parks to visit, only five of which are in the continental U.S. Don’t worry, we’ll still manage to find plenty of destinations, our in-progress summer plans are shaping up and we’ll be helping celebrate the 150th anniversary of our northern neighbors come July and August. More on that to come. This entry was posted in Destinations, Upcoming Travel and tagged Arizona Road Trip, Arizona Travel, Canyon de Chelly, Death Valley National Park, Flagstaff Travel, Grand Canyon National Park, highkicktravel, Petrified Forest National Park, Saguaro National Park, Spring Travel 2017, Tucson. Bookmark the permalink.